L I V I A: [LOOK TO MAINTAIN HEALTHY LOOKING HAIR WITH THE POWER OF NATURE'S OILS] FEAT THURSDAY PLANTATION TEA TREE EVERY SHAMPOO + CONDITIONER, REVIEW! [LOOK TO MAINTAIN HEALTHY LOOKING HAIR WITH THE POWER OF NATURE'S OILS] FEAT THURSDAY PLANTATION TEA TREE EVERY SHAMPOO + CONDITIONER, REVIEW! Ever knew that tea tree can achieve the same results for your hair? We may use it for our skincare regime, but the properties that nourish and soothe the skin, can do the same for your hair. Thursday Plantation now offer their Everyday Shampoo and Conditioner range where it's the ultimate way to combat the changing weather conditions. It looks to care for your scalp and hair follicles from the root to tips. 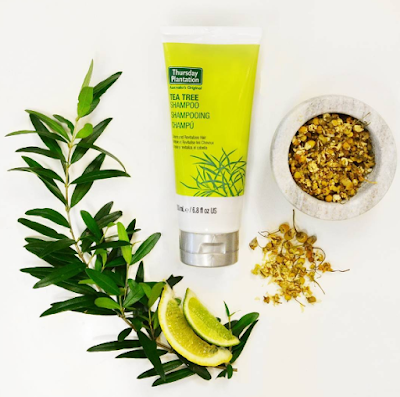 Majority of their products contain 100% pure Australian Tea Tree oil so that it cleanses and maintains your scalp's health. From trying both the shampoo and conditioner on my hair daily, the products help to boost shine and healthiness to my hair (without stripping the hair's natural oils). It smells like tea tree oil and very natural so it's bearable for me. My hair just feels soft and manageable after washing - giving it a clean and refreshing feeling. As the products are 100% pure of Australian Tea Tree oil, which is known for their antibacterial properties, your scalp will feel revitalised and strong after using it. If your hair is normal to oily, then this is the ideal product because it helps to gently cleanse the scalp without stripping any natural oils. Plus, if you suffer from itchy scalp, it helps to soothe any irritations or itchiness. Ingredients contained in the products include: Chamomila Recutita Flower extract, Aloe Vera and Jojoba to hydrate and condition the scalp, lime and lavender oils. So for the Thursday Plantation Everyday Tea Tree shampoo, it cleanses and revitalises the hair well by ensuring that your locks remain super soft and healthy looking. If you're like me, I literally wash my hair every single day, so it's important that I seek a shampoo and conditioner that's healthy to use in the long run, just like Thursday Plantation's Tea Tree Everyday shampoo and conditioner. The Everyday Tea tree conditioner by Thursday Plantation also does a splendid job in detangling, revitalising and adding more body to your hair. It's ideal for those with oily and normal hair types. Once again, the conditioner contains 100% Australia pure Australian Tea Tree oil, so it's amazing to lather your hair in products that keep your hair cleansed (in the most gentlest way). As someone who has oily hair from time to time, I found that by using the Tea Tree Everyday shampoo and conditioner range, it left my hair feeling cleaner for longer. This is useful for when the weather warms later in the season as you'd want your hair to feel fresh often. Have you tried out the above? Thank you Thursday Plantation for supporting me for this review. My reviews are based on my personal and true experiences. I only recommend products that I truly support.